With a fresh mound of tamed onions and seri atop tender pieces of crisp-skinned chicken, this simple meal strikes the perfect balance between effort and taste. A culinary fireworks display of textures, tastes, and flavors, the chicken is simply seasoned with salt and pepper before being pan-fried until the fat in the skin has rendered out, and it’s crackling-crisp. The salad on top is a crisp julienne of tamed scallions with seri, which is tossed with a simple soy sauce and rice vinegar dressing. 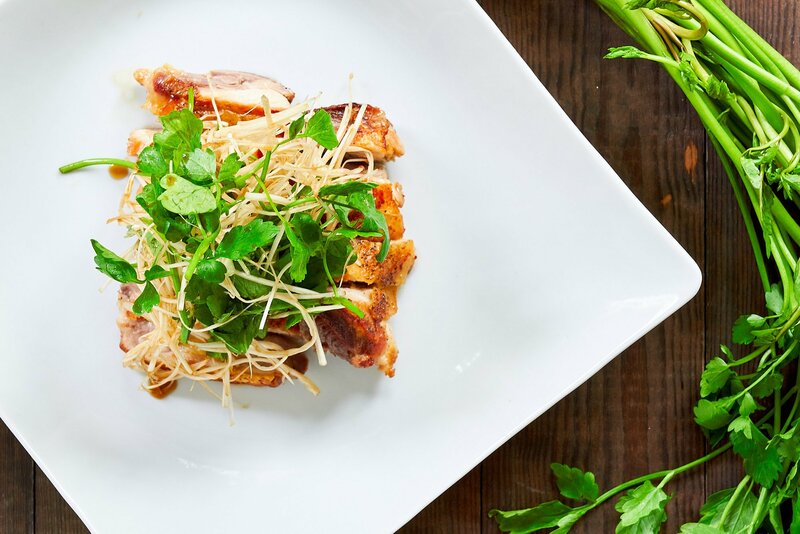 Together, the fresh, vibrant salad balances out the rich, juicy flavor of the chicken, making for a complex, yet balanced dish that belies its simple preparation. There are a few kitchen tricks that make these ordinary ingredients extraordinary. The first thing is that I use a weight on top of the chicken while it’s cooking. 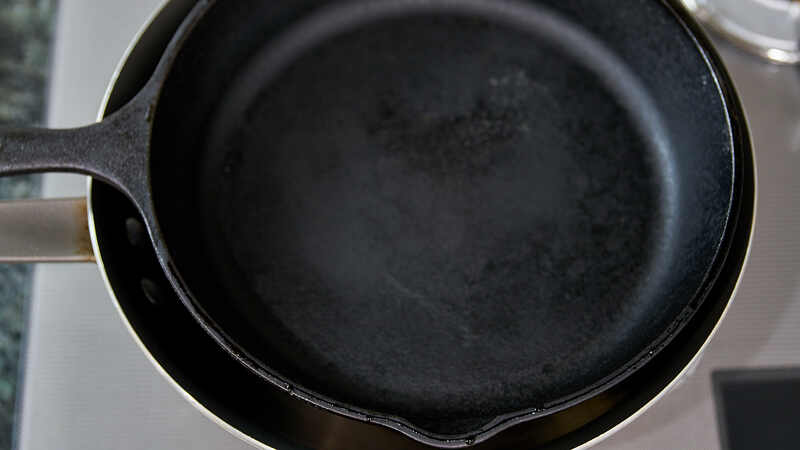 This increases the chicken’s contact patch with the pan, which not only helps it cook more quickly, it also ensures that every bit of skin ends up golden brown and crisp. This also eliminates the need to add oil to the pan, while rendering out most of the excess fat from the chicken. For the scallions, I like using the white parts for this dish, because they are more tender than the green parts. 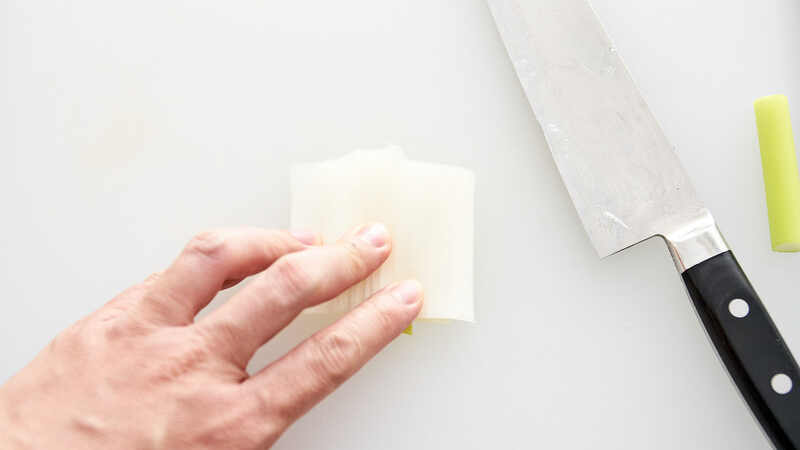 Slicing the scallions into thin ribbons and then taming them in a baking soda solution, breaks down the volatile sulfur compounds (which make raw onions spicy). This leaves the pleasant sweet flavor of the scallions along with their crisp texture, that adds both complementary and contrasting flavors and textures to the savory chicken. 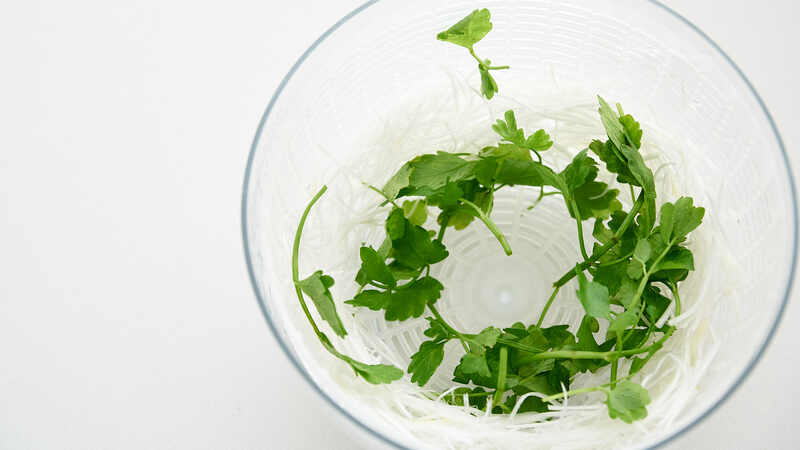 The green herb in the salad is called seri in Japanese, but it’s also known as Minari (Korean), Chinese Celery or Java Dropwort. It’s an Asian herb that grows in wet areas such as along streams and around lakes and can usually be found in Asian grocery stores. 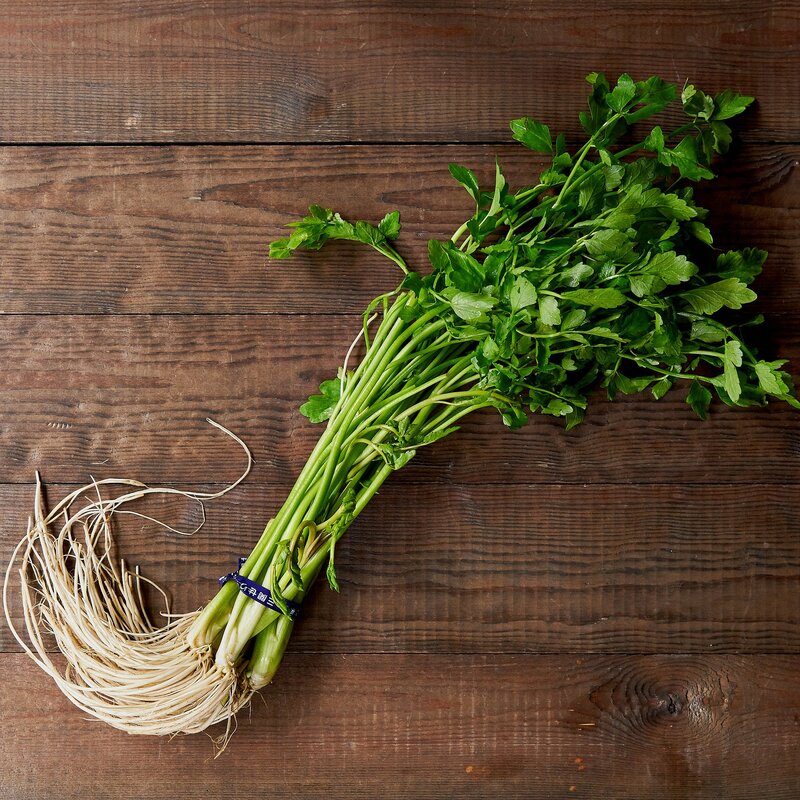 If you can’t find it locally, you can substitute watercress, arugula, or cilantro in the salad. Whether you decide to serve it topped with the salad or not, the crispy skinned chicken works with all sorts of sauces and toppings. 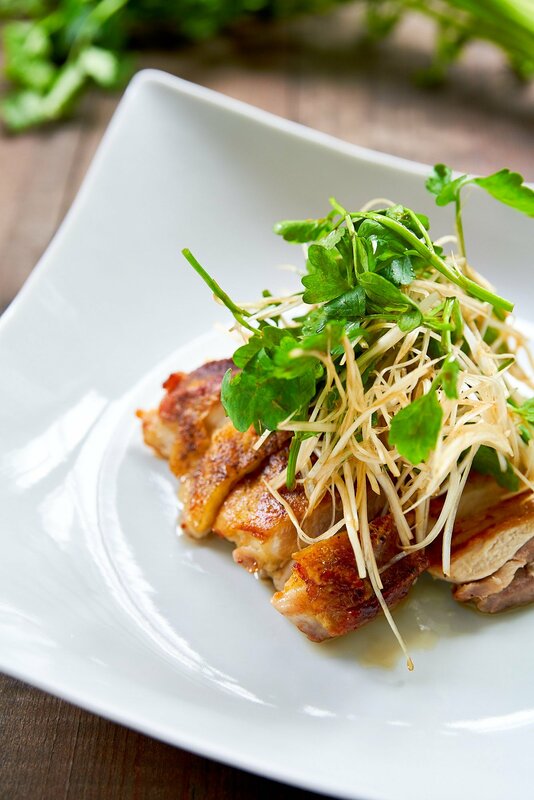 If you decide to forgo the salad, try the crisp chicken with teriyaki sauce, korean fried chicken sauce, or even by itself, with a sprinkle of lemon zest and a splash of lemon juice. Dissolve 2 teaspoons baking soda in 4 cups of water, and stir to dissolve. Cut the scallions into 2-inch lengths. Cut a slit halfway through the scallions lengthwise to their core. Unfurl the scallion, spreading it out flat. 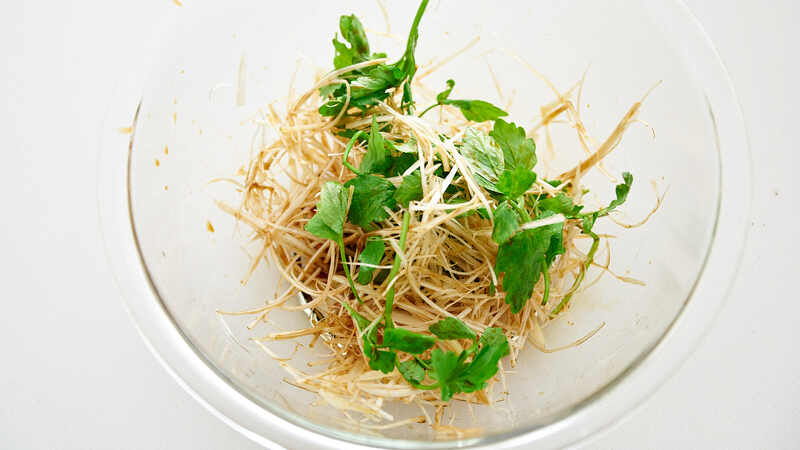 If the scallion has a solid core, remove it and use it for something else. 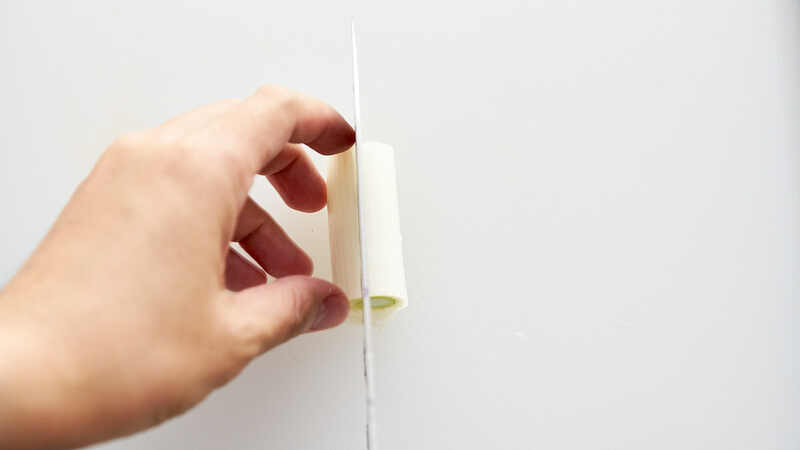 Slice the scallion into very thin ribbons lengthwise (with the grain). Drop the scallions in the baking soda water and let it tame for at least 15 minutes. For the seri, use just the leaves and tender stems. When the scallions are no longer overwhelmingly pungent, drain them and wash them thoroughly with cold water. Spin the scallions and seri in a salad spinner to dry. 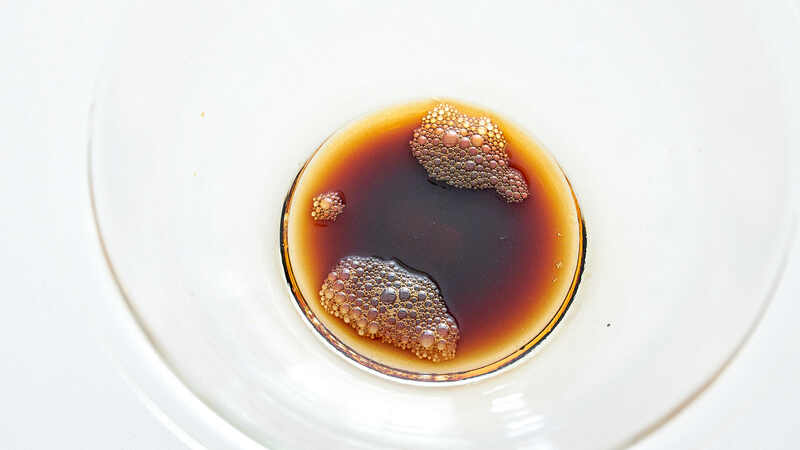 Make the dressing by whisking together the soy sauce, rice vinegar, and sugar and set aside. For the chicken, salt, and pepper both sides to taste. 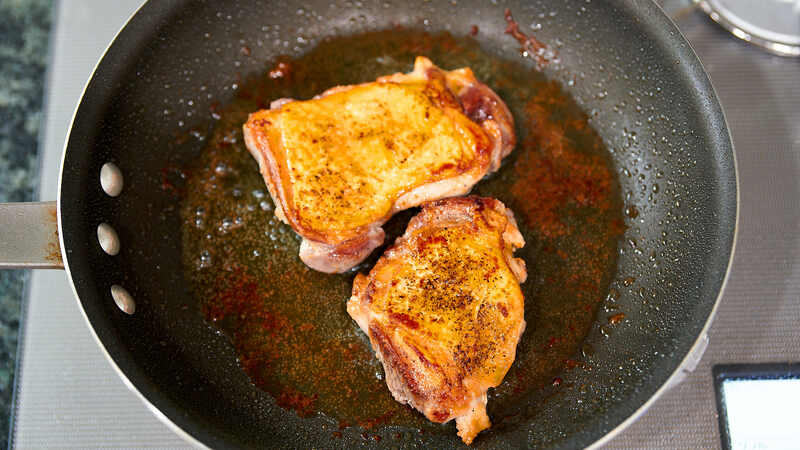 Put the chicken skin-side down in a non-stick pan and then set a heavy pan on top of the chicken to press it down. Turn the heat on to medium-low and fry until the skin-side is well browned and crisp (7-10 minutes). Remove the weight and flip the chicken over, frying the second side until the chicken is just cooked through. 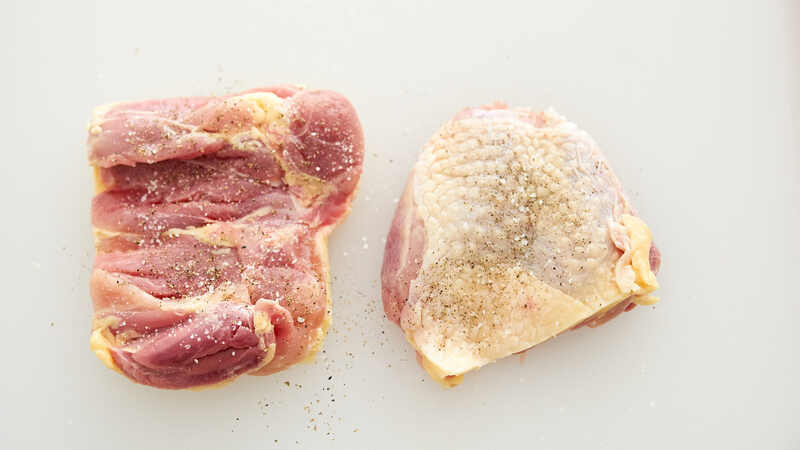 Transfer the chicken to a cutting board and let it rest. Toss the scallions and seri with the dressing. 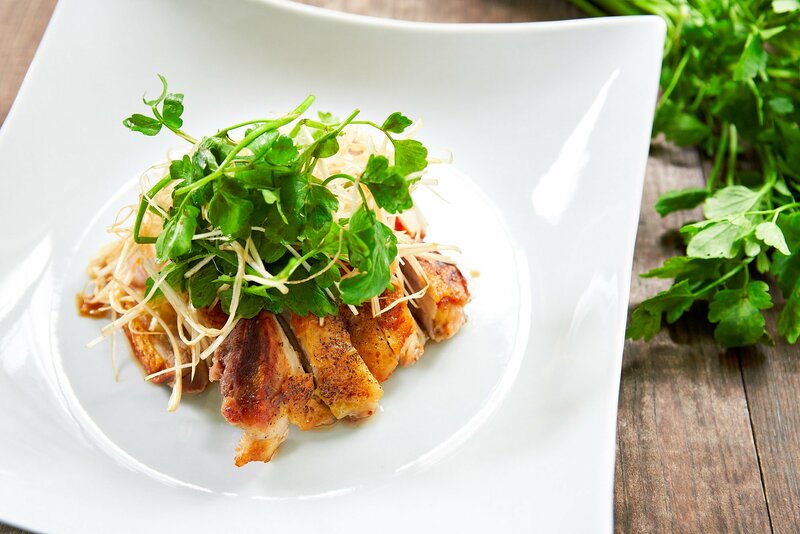 Slice the chicken and plate, topping with the scallion and seri salad.